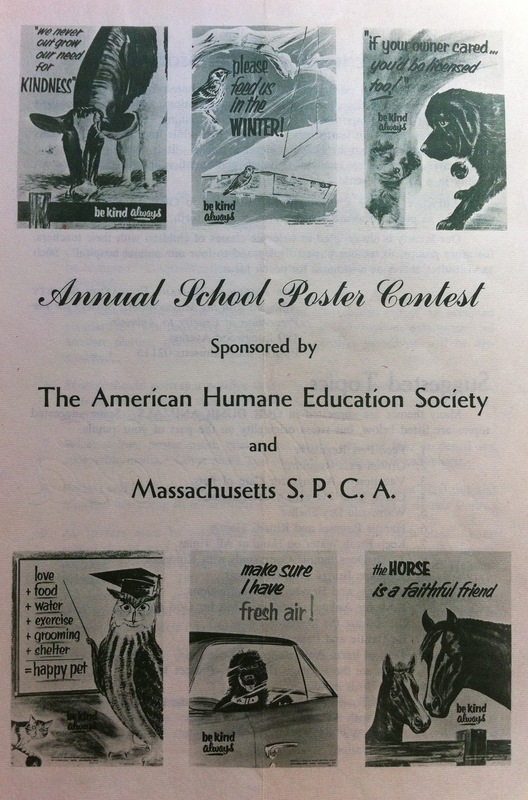 The Massachusetts Society for the Prevention of Cruelty to Animals (MSPCA) and the American Humane Education Society held an annual poster contest for school children. These events were thought to be especially beneficial for children because the students participating in these contests “learns how to care for pets while improving his art skills through portraying what he believes in on a poster.” In other words, training in the arts, creative expression, and Humane Education were understood to go hand-in-hand. Brochure for annual poster contest sponsored by the American Humane Education Society and the Massachusetts Society for the Prevention of Cruelty to Animals. Collection of MSPCA Angell.